The Power Speed Agility Evasion Belt by Uber Soccer is great for increasing your speed, agility, power and coordination. 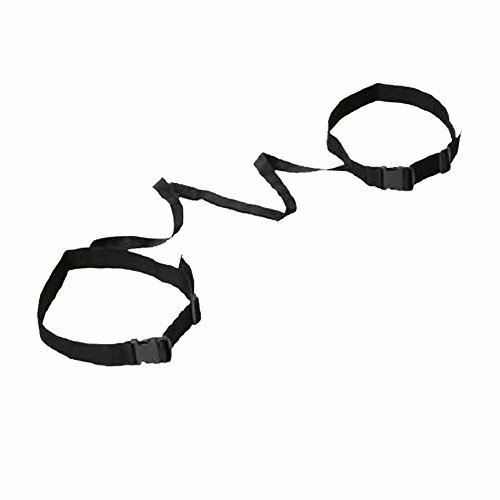 Sometimes referred to as a breakaway belt, it can be used for a variety of chasing and shadowing drills training. In contact sports, to out maneuver an opponent, the attacker must move faster than the individual marking him can react. More often than not, it is the first two to three steps that will make the space needed to either avoid your opponent or be taken down by him or her. At the same time, the defender must learn how to read subtle changes in body position, constantly be on his or her toes, and react quickly to the movements of the attacker if they are to keep the opponent from accomplishing his or her objectives, so to speak. These small-spaced multi-directional agility skills are fine-tuned through evasion belt drills. The belts put players into a competitive one-on-one encounter by using a tear-away linking between the two belts. The Uber Soccer Evasion Belt includes (2) waist harnesses that are adjustable from 20 inches to 42 inches, a nylon webbed strap that is attached in the center by Velcro and a nylon Carry bag for storage and transport. Perfect for soccer, tennis, football, la crosse, field hockey, track and field and more. A great training tool for athletes, coaches, trainers and sports teams. If you have any questions about this product by Uber Soccer, contact us by completing and submitting the form below. If you are looking for a specif part number, please include it with your message.